This map shows the global temperature anomalies for July 2, 2015. You can clearly see the hotspots over the Pacific Northwest of Canada and USA, Greenland, Europe, the Central Asian republics and the Chukchi Peninsula and parts of far eastern Siberia. There are cold spots too: parts of Alaska, the US midwest from the Great Lakes east, Russia and northern Siberia, and north eastern China and the Korean peninsula. Averaged out, the whole globe had a +0.60C temperature anomaly. The southern hemisphere anomaly was much smaller with +0.08C, and a very cold Antarctica with an anomaly of -3.62C. 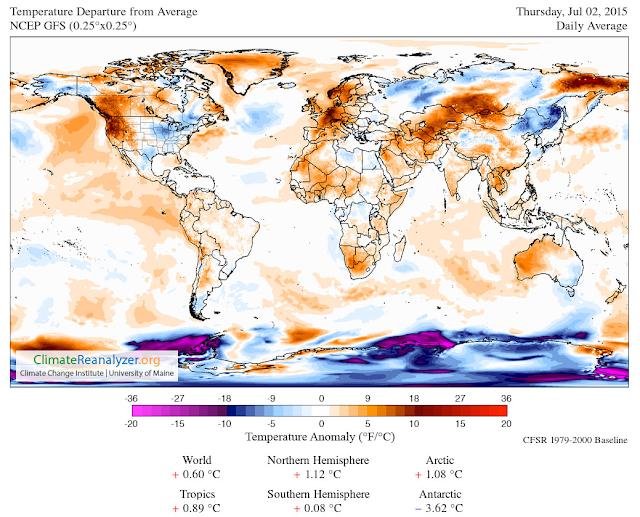 No wonder in Melbourne and south-east Australia everyone was rugged up with an icy blast coming directly from Antarctica, while Western Australia was on above average temperatures. New Zealand saw temperatures plummet last week due to a polar blast, but failing to set cold records. The Northern Hemisphere is warming faster than the Southern Hemisphere. The reduced temperature differential between the Arctic and mid-latitudes causes the jet stream to go wavy causing hot and cold spots to develop and be sustained for days and sometimes weeks.